Jasper E. Ferris (1843-1934) is an interesting leaf from the Jeffrey Ferris family tree. In fact, I wonder if I have two separate people combined as I gather his information. If not, he is the winner of the “Most unusual occupation by a Ferris” award. Jasper is the great-great-great-great-great-great-grandson of Jeffrey. He was born to a Ferris family of farmers who lived in Montgomery County, Ohio. He was one of eight children. In 1870, the U.S. Census finds him living with his mother’s relatives in Shelby, Indiana with his wife, Phebe. She was 21 at the time, it seems. By then they had two daughters, the oldest of which was born when Phebe was 17. I have not found evidence of a marriage as yet. He kept moving. In 1880, the family was in Dry Creek, Missouri. Four children were living and one daughter had died in 1879, aged three. There was no 1890 census so our friend Jasper does not reappear until 1899. Phebe died, place and year unknown, having provided him six children. This is where I am concerned that I may have combine two people. 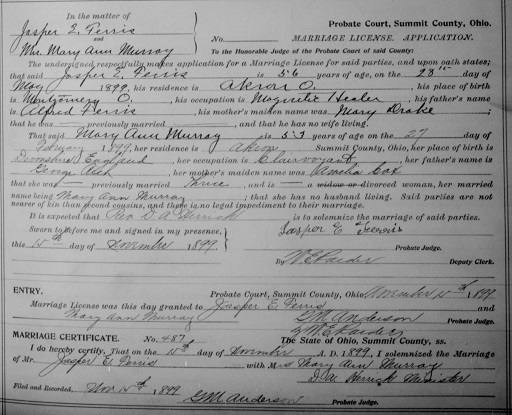 For, in 1899, Jasper E. Ferris marries Mary Ann Rich Murray in Summit County, Ohio. Mary Ann is a native on England and, based upon her marriage license, Jasper would be her fourth husband. She was a divorcee at the time of their marriage. Also of note is that Jasper says that this is his first marriage. On the application, the parties must list their occupations. Mary Ann was employed as a clairvoyant. With Jasper becoming her fourth husband, it is unclear just exactly how good she was. And, the prize winning occupation, for Jasper, was magnetic healer. At the time, electricity was all the rage. While, in more modern times, folks resort to wearing bands of magnets or copper bracelets to evoke healing, it was much more scientific in Jasper’s time. All sorts of contraptions were available for a magnetic healer to use with patients. Some resembled a prison’s electric chair. Some were of a more intimate nature, relieving “hysteria” in women. And some healers were skillful in using their hands to transfer their thoughts and energy to the patient. I have not found any advertising for either Jasper or May Ann, nor any other indication of how they practiced their occupation. Jasper was living with his youngest son, E.J., in Aurora, Colorado in the 1930 census and died there in 1934.